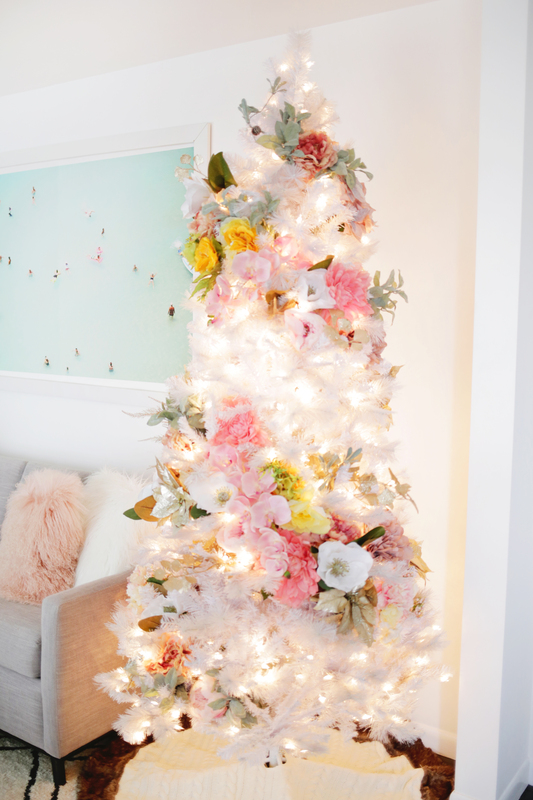 How beautiful is this floral tree?! 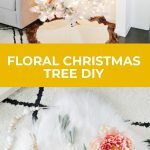 I’ve seen some really pretty trees in hotels and city centers over the years that have included faux flowers or poinsettias in them, and so I thought it would be fun to parter with JOANN to create a floral tree look! 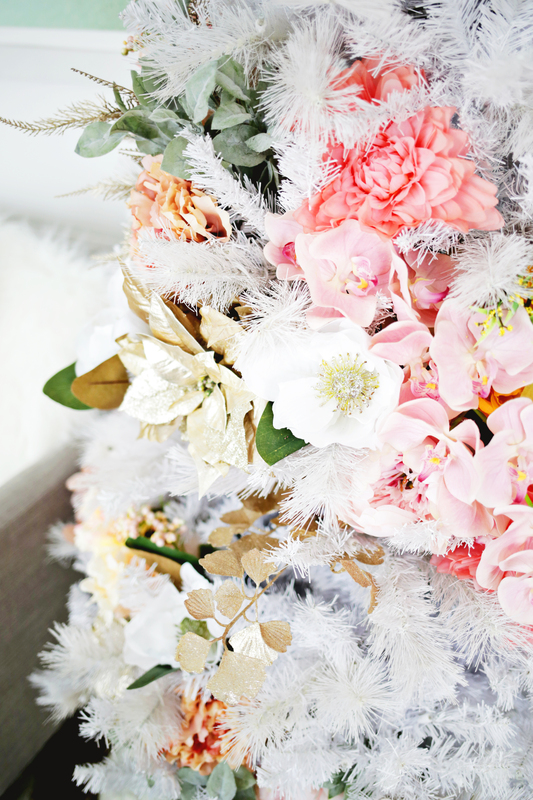 The nice thing about using faux flowers and greenery is that you can save the flowers, like you would any other ornaments, to use the next year as well, and they’ll look as fresh and as pretty as ever. 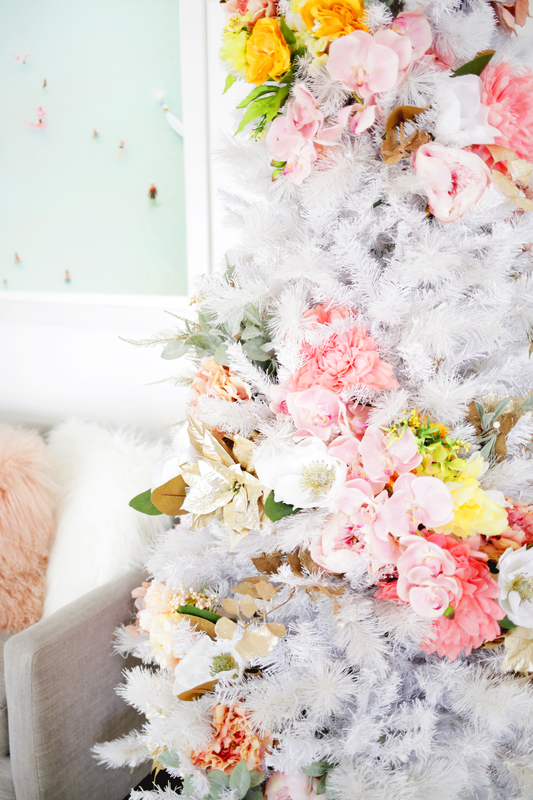 Once you pick out the flowers you want to use, it’s actually a pretty quick decorating process—I’ll show you what I did to create mine! 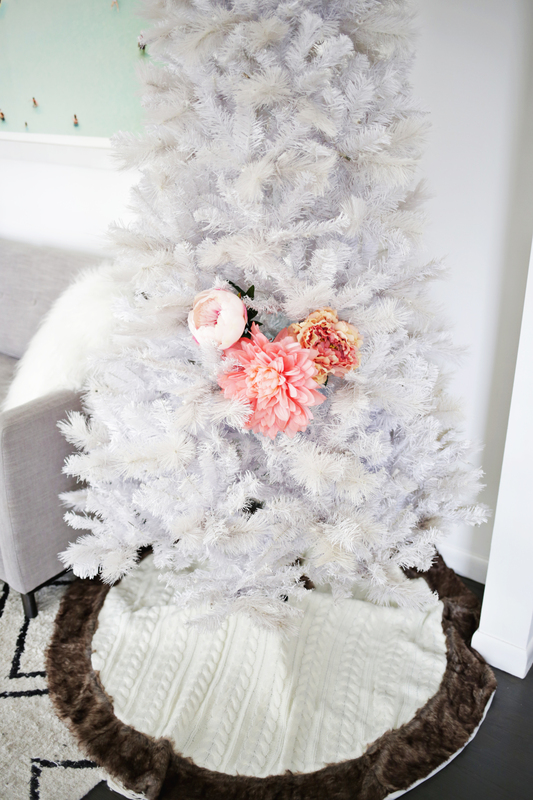 When choosing your flowers, decide if you want to do a super colorful tree or something a little more subtle (like all whites and metallics) and take into consideration the color of your tree as well (whether you have a green tree or a white or other color tree). 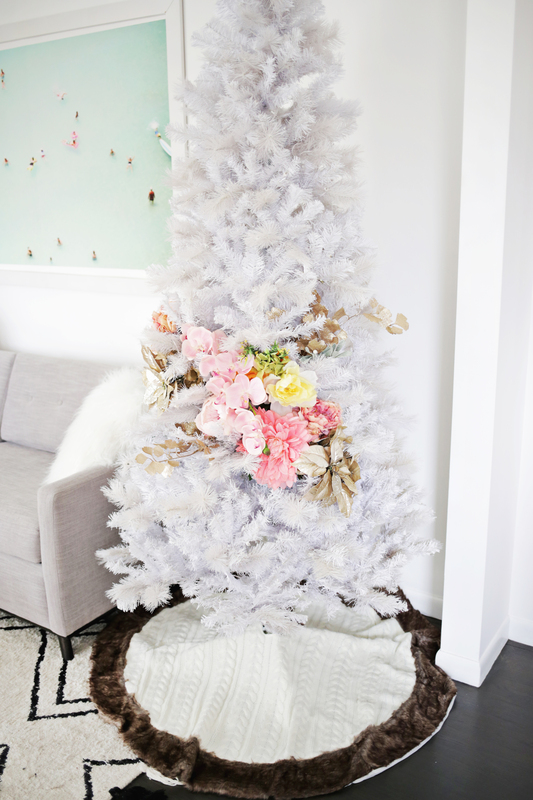 Since my tree is white, I choose to accent the flowers with greenery and bits of gold and choose a few larger white flowers to be some neutral pops in all the color. 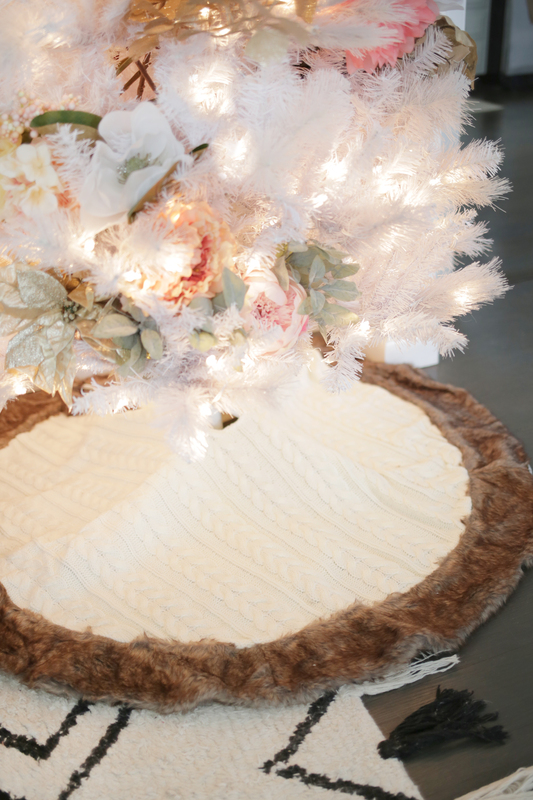 If your tree is green, I would suggest the opposite, so do white and gold (or silver) accents to your color and then just a little bit of green woven in. 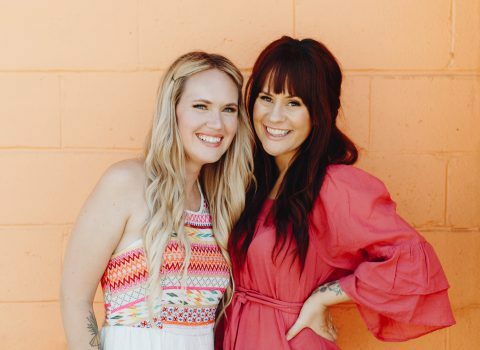 Thankfully, JOANN has so many florals to choose from, so it wasn’t hard at all to pick out a ton of beautiful flowers in various shades and sizes. This is definitely a situation where variety is your friend, so it was great to have lots of options for this project. 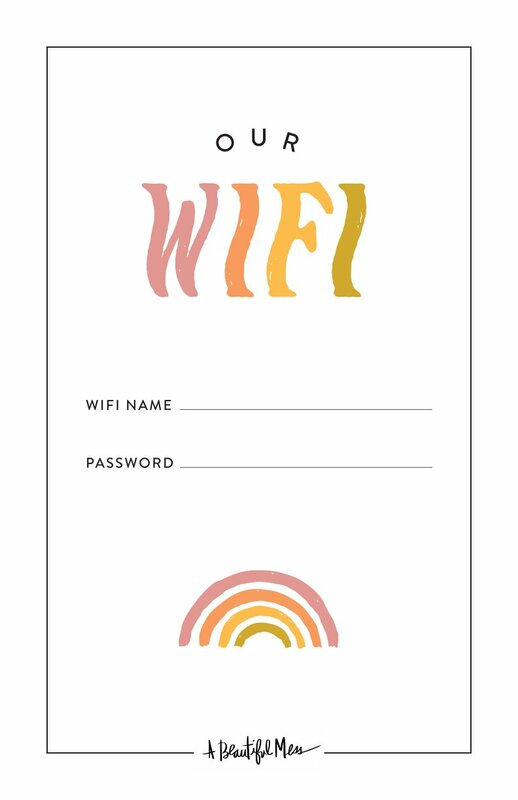 I did various shades of pinks and mauves with a few yellow/orange flowers, but you can choose whatever colors compliment your home and other Christmas decor. Now comes the fun part—attaching them to your tree! I decided to wind my flowers up through the tree like a garland rather than spreading them out evenly. You could totally take the time to wire all the flowers together to make an attached garland, but I found it much easier (and a lot faster) to simply stick the stems into the tree where I wanted the flower to be and they stay put really well. I thought for my size tree that seeing four rows of florals would look good, so I started by sticking some larger flowers into where I thought the second row from the bottom would sit. You can either just work outwards from a few flowers in one place (like I did above) or use your main largest flowers to kind of block out generally where the garland trail will follow, and then fill in gaps with smaller flowers as well as the greenery and gold accents—like a connect-the-dots situation. The key to making a “random” assortment look balanced is to always be thinking about scattering your different tones and colors evenly throughout the project so you don’t have most of your gold/green/bright pinks, etc., in one corner but each category is spread out with little bits of each here and there. Anyway, just keep adding in flowers and accents, and don’t forget to wind up the tree so you are making the trail of flowers higher or lower as needed as you go. When you get to the end point and the beginning points of your garland, just trail off the flowers so it fades out nicely. Also, I’m of the mindset that says “why decorate what you can’t see,” so I don’t usually put much on the back of my tree since it’s against the wall (and it saves you money on decorating supplies). Feel free to just decorate the sides you can see if you don’t have a tree that’s visible from all sides. 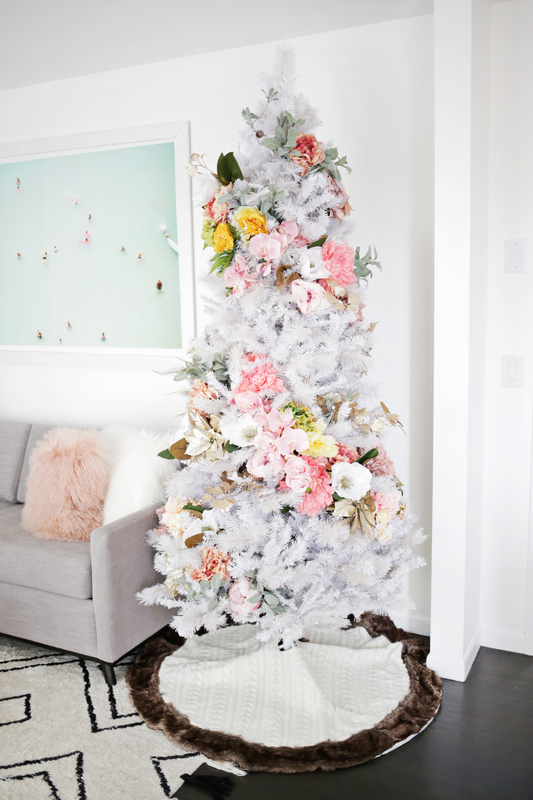 You can also incorporate ornaments and other garlands into the look, but I decided to keep it simple and just use flowers for mine. 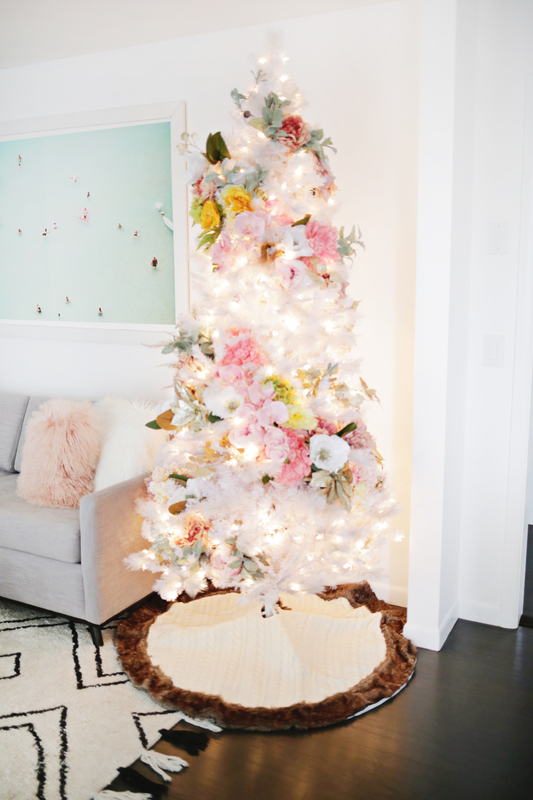 Also, you can wire the flowers to the tree up to a certain height if you are worried about little hands or pets pulling the flowers off and that will give you more stability there. 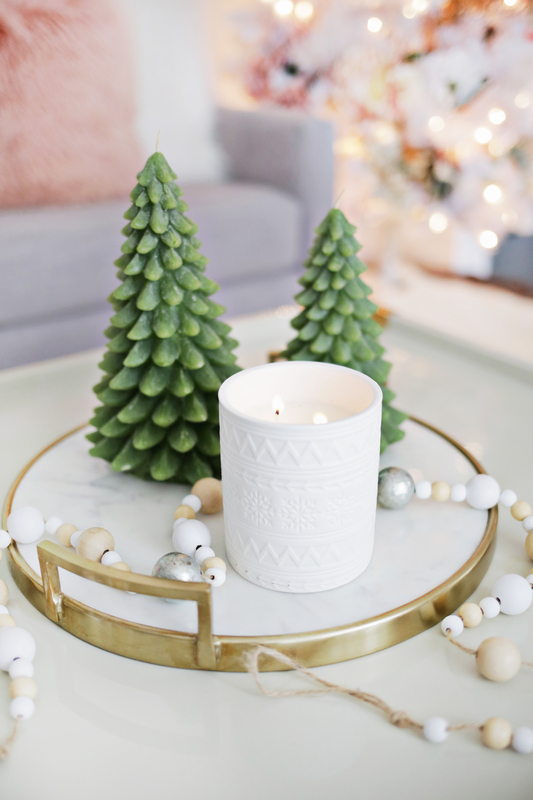 Since JOANN has such a wide array of Christmas decor, I couldn’t help but also pick up a cute tree skirt and some holiday candles while I was there to make a little coffee table display (love that tree candle and the sweater pattern on the white one is so cute!). 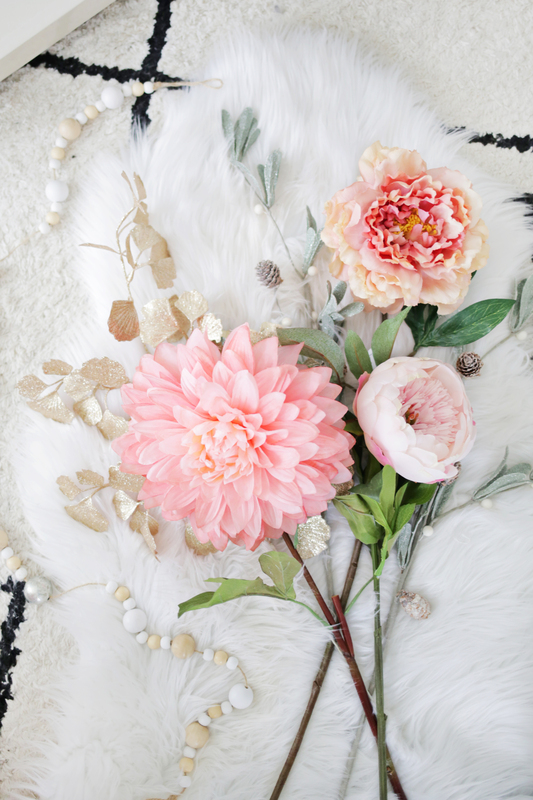 Don’t forget that you can hang garlands, but you can also use them as tabletop decor like I did with this wooden garland. I am not a theme Christmas tree person. 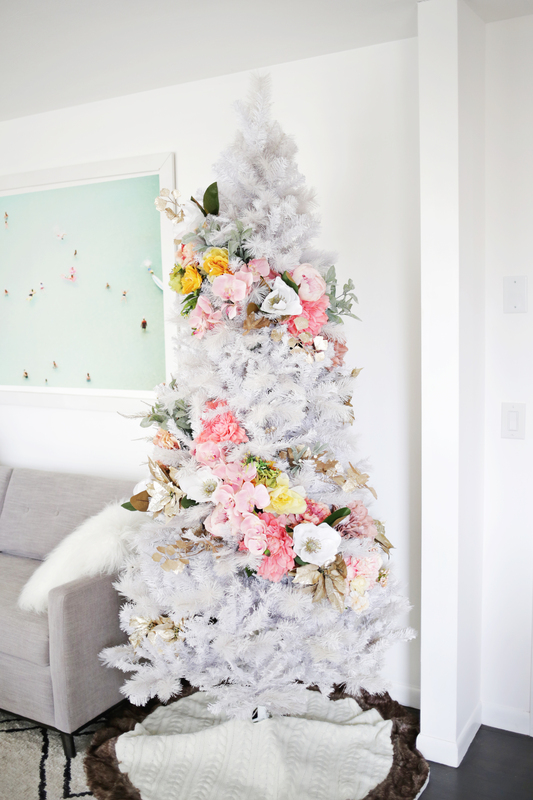 Love a hodge podge tree, but this is gorgeous and I want one immediately. OH. MY. GOD. This is what dreams are made of. Now.. I just have to convince my husband for next year. 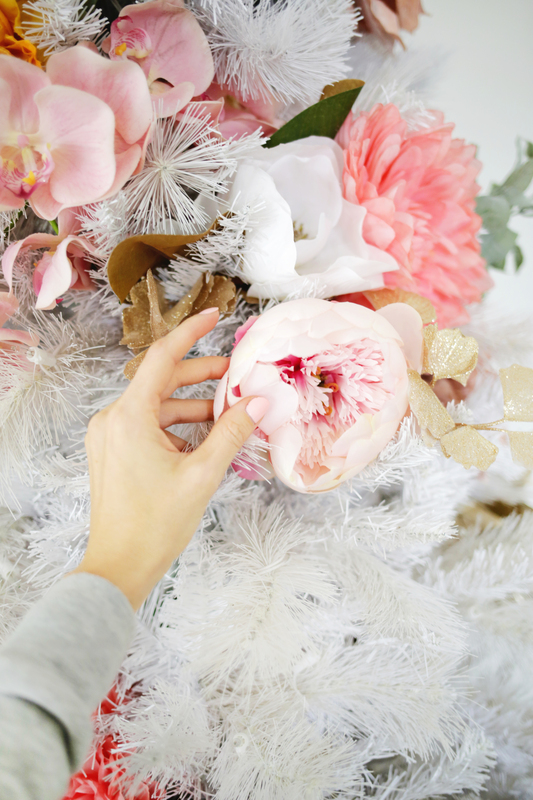 This is the prettiest Christmas DIY I have seen so far this season! 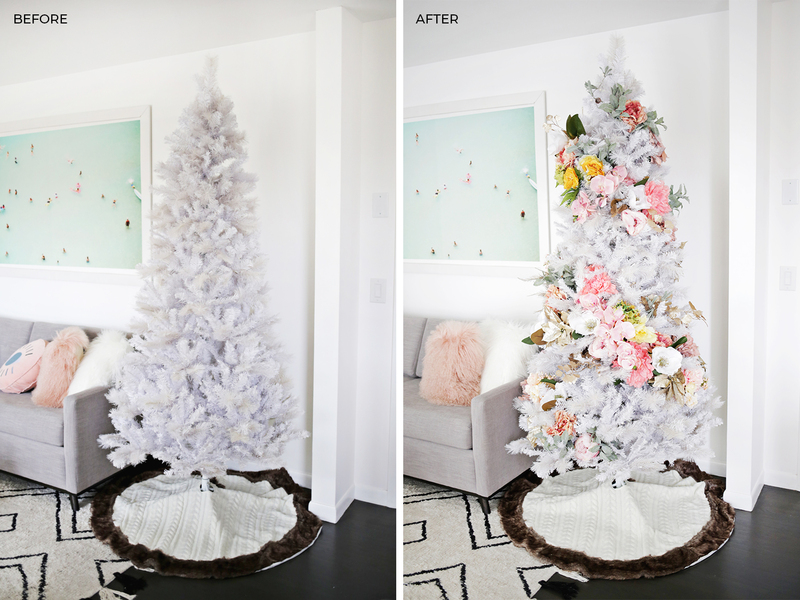 I love this idea—I might try it with one of the smaller 4-foot trees. Thank you for sharing! I love the white floral tree. Also, where is that wall decor from? Lovely! One year I had gotten a live tree but all my ornaments were in storage. I put on lights, bought cheap lace as a garland and put babies breath throughout. It was lovely.